This week marks the celebration of Passover. I learned about the celebration of Pesach in my Catholic school religion class many years ago when we were discussing the Last Supper during Holy Week. 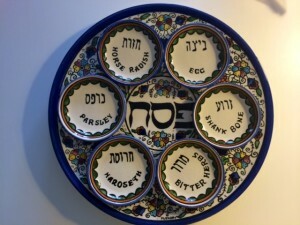 What I never learned about was the significance of the Seder plate. Parsley a vegetable (parsley or potato is generally used), is dipped in salt water to represent tears. Hard-boiled egg, interpreted this as a symbol of mourning for the loss of the two Temples (the first was destroyed by the Babylonians in 586 B.C.E., the second by the Romans in 70 C.E.). The egg symbolized this loss and traditionally became the food of mourners. Bitter herbs represents the bitter life of the Israelites during the time of their enslavement in Egypt. I find joy in the celebration of both holidays which are full of joy, hope and rebirth. Happy Passover and Happy Easter to all who celebrate! This entry was posted in Family, Food, Fun, Grandmas & Grandpas, Holidays, Moms & Dads and tagged Easter, Passover by llpitlwp. Bookmark the permalink.